THINK about this for a moment. Imagine a car that had zero toxic emissions, didn’t burn fossil fuels, was environmentally friendly, and had just one waste product – water. Such vehicles exist, and are powered by hydrogen, an as yet untapped commercial fuel market that involves creating the gas using variety of technologies, including electrolysing water. Hydrogen gas is then mixed with oxygen in a fuel cell inside the vehicle to power an electric motor, which ultimately gives the car its power. Don’t think this is some small time thing either. It’s already a $1 Billion plus industry on a massive global scale, and it’s growing – fast. As of right now, there isn’t a single commercially available hydrogen powered road car, anywhere in the world. And while test vehicles including the Chevrolet Equinox Fuel Cell, Honda FCX Clarity, Mercedes Benz B-Class F-Cell, and Hyundai ix35 FCEV exist overseas, there has never been a hydrogen fuel cell vehicle permanently based in Australia. But the game is about to change. In 2015, Toyota will release the Mirai, the first commercially available hydrogen powered road car (but not the first to go into mass production, Hyundai achieved that honour in 2013). More importantly, Australia now has a role to play in the fuel cell arena with the arrival of a Hyundai ix35 FCEV test vehicle. 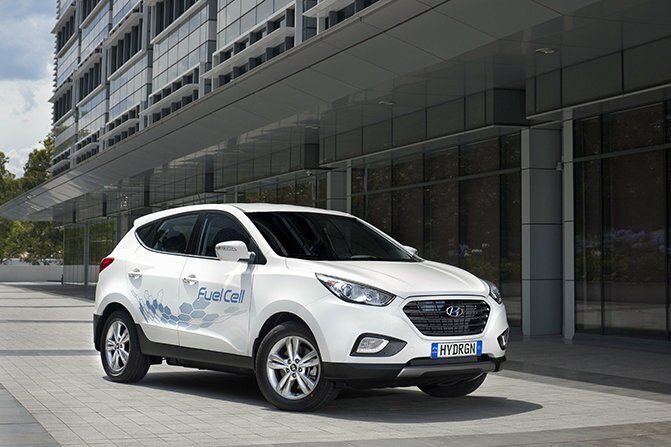 The vehicle is the first component of Hyundai’s plan to operate a test fleet of ix35 Fuel Cell vehicles in Australia. As such, it represents a pioneering step toward the commercial availability of emissions-free hydrogen powered vehicles in Australia. “Ultimately, we see no reason why Australians should not enjoy the same environmental solutions as consumers in other markets,” HMCA Chief Executive Officer Charlie Kim said. Wait though, there isn’t a single hydrogen refuelling station here in Australia either, but that’s about to change too. Australia’s first and only refueller station is being installed at Hyundai Motor Corporation Australia’s (HMCA) headquarters at Macquarie Park in Sydney as you read this. They also plan to build their own electrolyser at the site in 2015. Critics claim that while hydrogen is clean the process of making it requires energy, and if that energy does not come from renewable sources, then the clean fuel concept is floored, while supporters point to solar arrays as the solution to this conundrum. Hyundai’s plans, which include just such a solar array will create clean, on-site process for gas generation and delivery. But where to from there, one hydrogen refuelling station does not make a new fuel source for Australia, or cleaner, greener motoring for us, our kids and the future. In Europe and the United States, ‘Hydrogen Highways’ have been built by government and private partnerships for use by FCEV’s like the ix35 Fuel Cell, along with other hydrogen-powered vehicles such as buses, but the challenge of creating and distributing hydrogen through a viable, sustainable network in Australia is a significant one. “Hyundai strongly supports the idea of a ‘Hydrogen Highway’ in Australia like those already in operation overseas, and we are committed to working with local partners to try to facilitate this,” Mr Kim said. Among the proposals doing the rounds is a possible ‘Hume by Hydrogen’ concept, which could link Australia’s two largest cities via the nation’s capital. It would require refuelling stations in Melbourne, Sydney, Canberra and in between, and could see hydrogen vehicles, including buses, running on the Hydrogen Highway emitting nothing but water vapour. While the tyranny of distance across our wide brown land is likely to hinder the viability of a hydrogen refuelling network in the short term, the idea behind it offers a strong environmentally friendly solution to the future of motoring, without burning fossil fuels, and that can only be a good thing. Power – The ix35 Fuel Cell develops 100kW of power and 300Nm of torque and has an official maximum range of 594km. A Hyundai ix35 Fuel Cell set a record in early July for the longest journey completed by a vehicle on a single tank of hydrogen, driving 700km through Norway, Sweden and Denmark. Speed – The ix35 Fuel Cell accelerates from 0-100kmh in 12.5 seconds and its maximum speed is 160kmh. It is no racing car, but it’s not slow. It’s like a normal car in most ways, but it’s an electric vehicle, so it makes no engine noise and has no gearbox. Safety – The ix35 Fuel Cell vehicle meets stringent global safety standards and it’s steel fuel cells are carbon wrapped and bulletproof (literally, they tested them by firing bullets at them). Refuelling – With an advanced, full-size 700bar (10,000PSI) refueller like those used in Europe and America, fill time is about three minutes, the same as a normal petrol or diesel car.